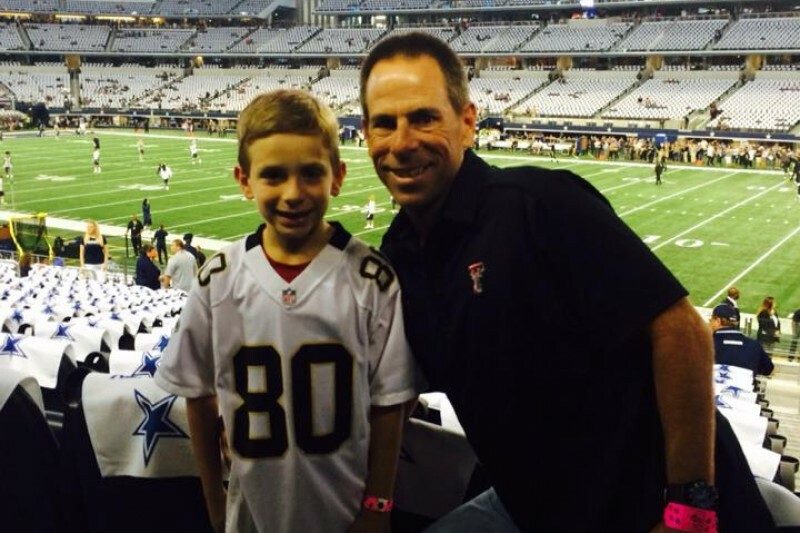 On Tuesday afternoon, nine-year-old Luke Siegel, son of former Texas Tech men's tennis coach and current Lubbock Cooper Pirate head tennis coach Tim Siegel, was involved in a golf cart accident in Lubbock, Texas that resulted in severe head trauma. The avid sports fan, baseball player and New Orleans Saints' fanatic was rushed to the hospital where he went into cardiac arrest upon arrival. Luke is a fighter - he knows no different - and has continued to show that over the last 48 hours. 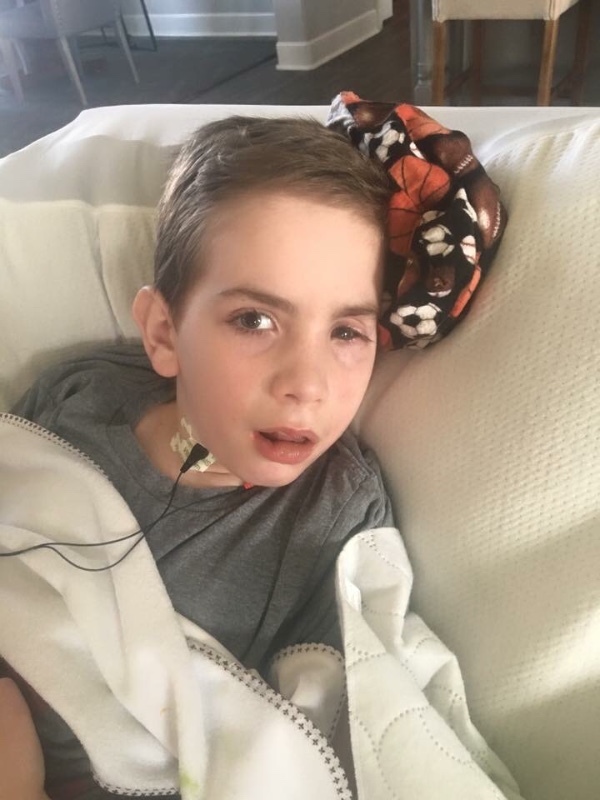 Doctors are optimistic the Cooper Pirate will return home but not without quite the road to recovery with brain damage, a collapsed lung and complications with his left eye due to the golf cart rolling on top of him causing several skull fractures and brain swelling. It is a waiting game as doctors continue to evaluate the extent of the brain damage and the next several hours will be key for the entire Siegel family, friends and loved ones. 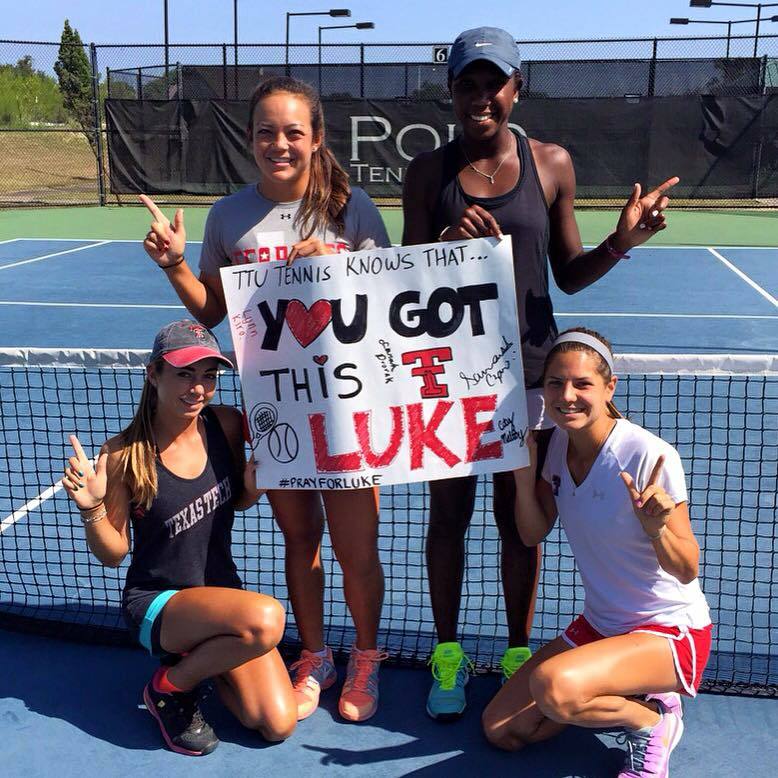 Alongside Luke, Coach Siegel, his wife Jenny and daughters Alex, Kate and Ellie are six of the biggest staples in the Lubbock community. Whether it's a Lady Raider Basketball game, dropping in on a Texas Tech Soccer practice, endless tennis at The Falls or a Lubbock Cooper/Idalou matchup on a Friday night - their smiles, welcoming arms and great hearts have touched so many lives throughout West Texas... It is because of this, the pediatric ICU waiting room full of people has extended down the hallways of University Medical Center day in and day out as Luke continues his fight following Tuesday's accident. I've never been more in awe of the love West Texas people share than I have been this week. The good Lord is the ultimate provider and there is no better doctor than Him, without question the Red Raiders' biggest fan is in the best hands possible around the clock. 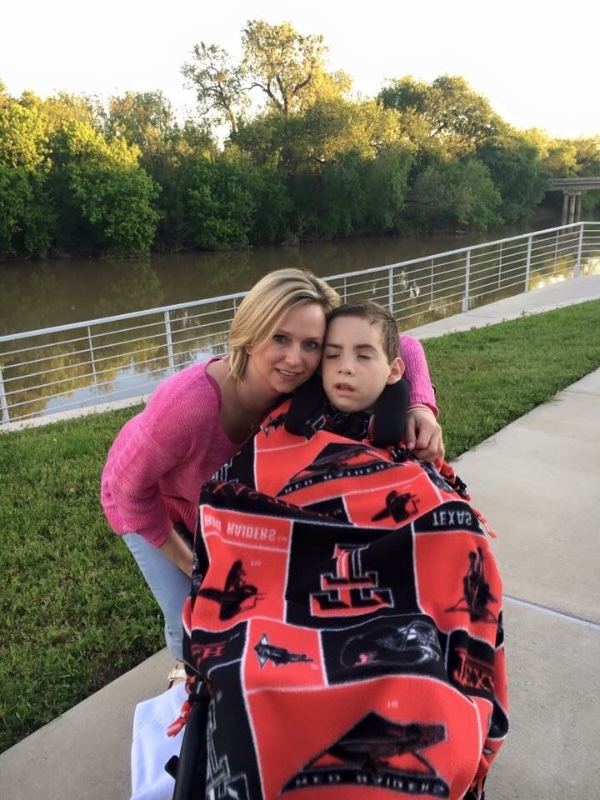 However, for all of us looking to lend a helping hand in any way we can for truly one of the most beloved families in Lubbock as medical expenses mount throughout Tim and Jenny's journey to bring Luke home - please donate however much you are led to leave. Most of all, PRAY. PRAY. PRAY. 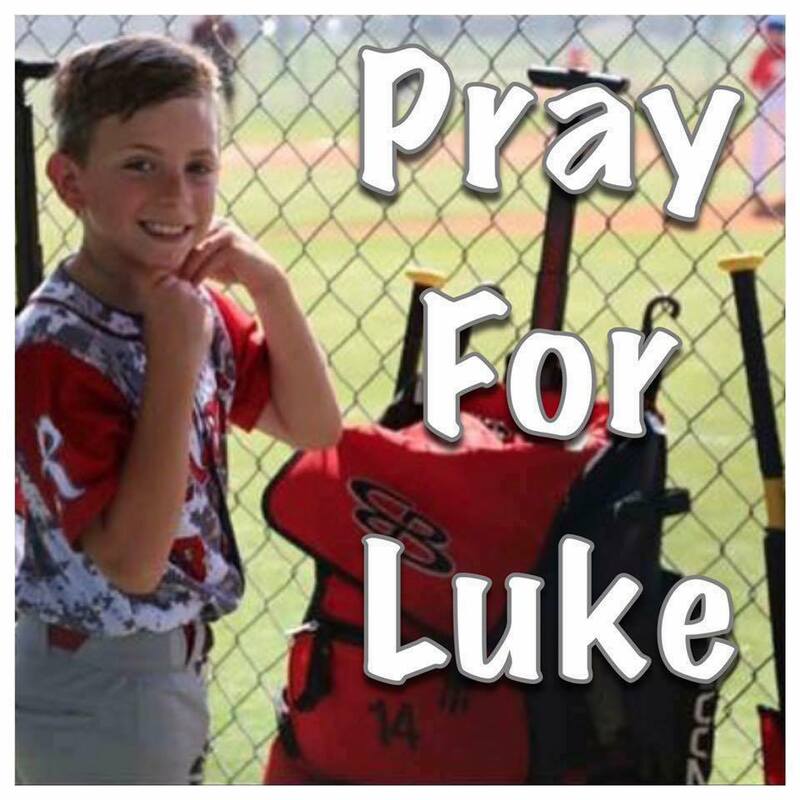 All of your prayers are felt so much every second, every minute of every hour as doctors work to heal sweet Luke while God brings comfort not only to Luke but to Tim, Jenny and the girls as well. Luke has had a busy past few months. He started back to school in August and attends until noon each day. He continues with therapy 5 days/week and has seen some improvement in limb movement and swallowing. 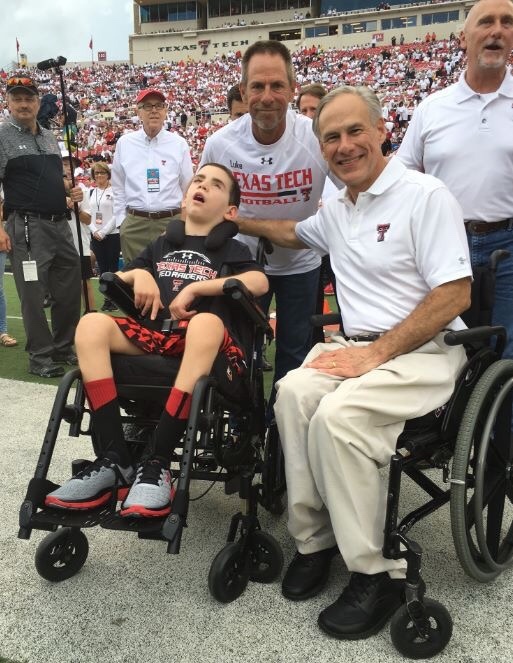 He was honorary captain at the Lubbock Cooper football game and got to meet Texas Governor Abbott at the Texas Tech football game. Just now leaving appointment. Feeling a bit deflated. Surgeon is really concerned about doing the deep brain stimulator and the risk of infection. Luke's scalp, because they had to go in 5 different times, is very thin (and currently superficially infected) where he would need to do the burr holes and thread the electrodes. He would have to move over a bit, and that would potentially have him passing wires through the area of the brain that controls motor function which could further damage that area. All this, and it could still not provide any relief. The goal would be to decrease tone, or "unlock" his upper extremities to help make Luke comfortable. He's not totally against doing it, but said the risks are definitely a lot higher than with a "normal" patient. So, for now we hold off and talk and pray about it. This was written by Jenny last night. "Not the news we were praying for, but we now look forward to the stem cell procedure. We leave Sunday for Duke. " Despite feeling crushed yesterday, there are 3 fighters in our hotel room. Luke, Jenny, and I will continue to give everything we have. This beautiful picture was the perfect medicine following our appointment. But a very, very tough one as well. 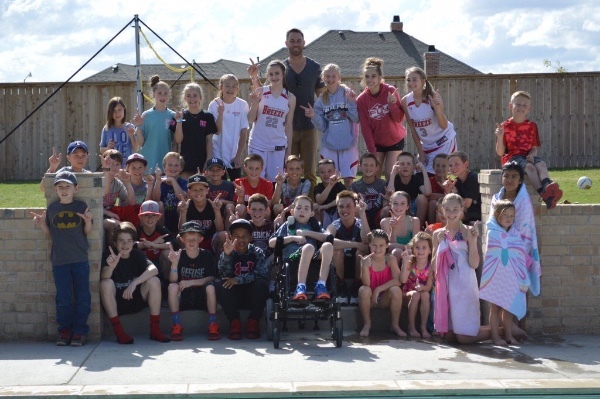 Luke had 36 of his closest friends at the house for his 10th birthday party. So great to have everyone at the house..... But to look in the backyard and see everyone running around while Luke was vocal in his wheelchair. It was all I could do to not get emotional and sad. Thank you Head Football Coach Kliff Kingsbury for being here. And for the balloons and cookies! An amazing coach and person. Thank you all for being here with us today. And everyday. We need you all for your support and prayers. Luke got video messages from Elvis Andrus of the Texas Rangers. David Thomas of the Longhorns and my New Orleans Saints. Jace Amaro of the Red Raiders and Jets. Toddrick Gotcher of Red Raider Basketball. So special. I will share these in the coming days. Good morning. I just kissed Tim and the girls goodbye as they head out for San Antonio. A friend gave them court side tickets for the Spurs/Thunder game tonight, so look for them on TV. They will be sitting next to the coach of the Spurs. Luke and I stayed home as I'm afraid the noise would have been too stimulating for him. 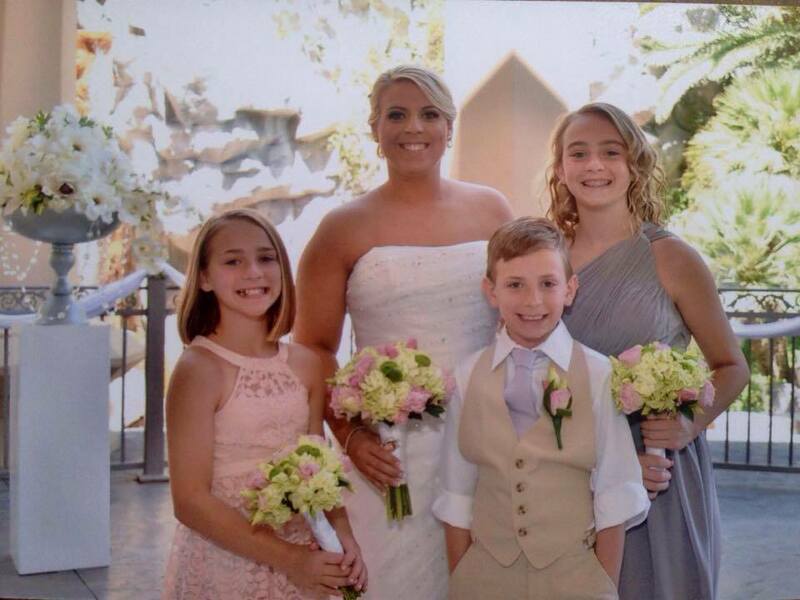 Tim, all 3 girls, and Matt (son-in-law) will be there. Luke had a great night. In fact, he is still sleeping❤️ He also had a great week of therapy. He started VitalStim (neuromuscular electrical stimulation) to help improve his swallowing. During one session of speech, he whispered to the therapist to "stop" as she was pinching his nose closed. With 2 older sisters in the house, "stop" was a word he used quite frequently. We have a very busy couple of months coming up. On Friday, we leave for OKC for Kate's bball tourney. We are all going and it will be Luke's first trip since the accident (not counting his follow-up visit in Ft Worth). Luke will start hyperbaric oxygen therapy a week from Monday. Each of these sessions is approx 2 hours long. This will be done daily (Mon-Fri) for 30-40 sessions. In April, Tim is going to see the Boss. Later that month, we travel to Frisco for more basketball, Garland for cheer, and Ft Worth to have evaluation with neurosurgeon for deep brain stimulator. We then travel to North Carolina for stem cell therapy. Luke also turns 10 next month. I can't believe my baby will be 10 . So currently, Luke does 5 sessions of PT, 4 sessions of OT, and 5 sessions of Speech weekly. He tolerates them all. I'm hoping he will tolerate the hyperbaric oxygen therapy. He is now on the blended whole foods (via feeding tube) and a little formula at night, and tolerating it well. Here is a pic from his VitalStim session. I hope you all have a great weekend and Spring Break with your kiddos❤️ Cherish and enjoy every single second. I can't explain it to yall enough how thankful my family is for not only your donations but for your support and prayers. Our sweet boy continues to fight and demonstrate such strength. He's my little hero. 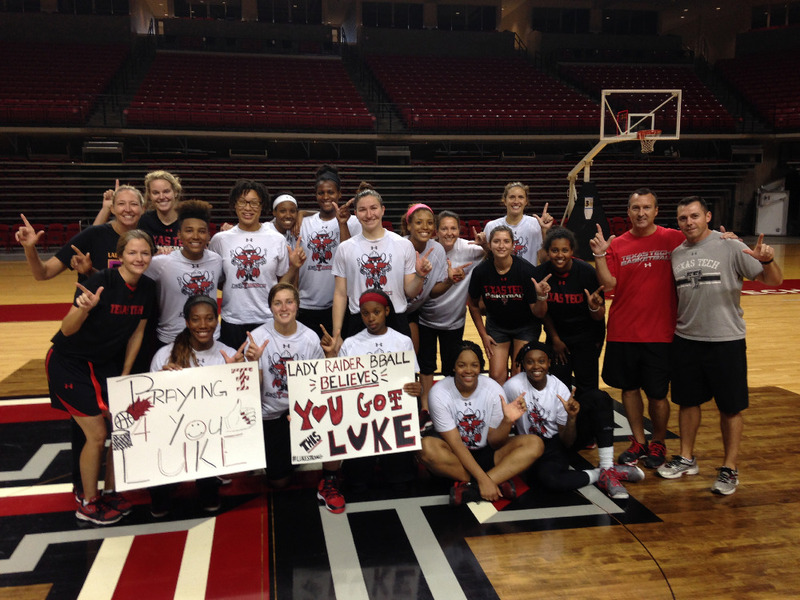 Praying for you, Luke, and for your family. 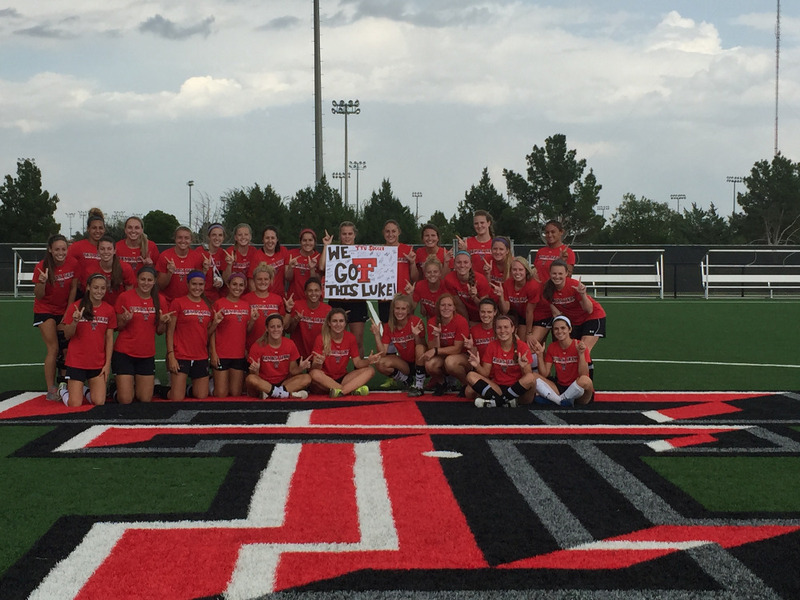 Blessings and good wishes are being poured out from the Texas Tech and West Texas community. Hope this makes things a tiny bit easier.